The 17th annual Association of Women in Finance (AWF) PEAK Awards were held on May 8, 2014 at the Fairmont Waterfront. The heavy rains outside did nothing to dampen the atmosphere inside. 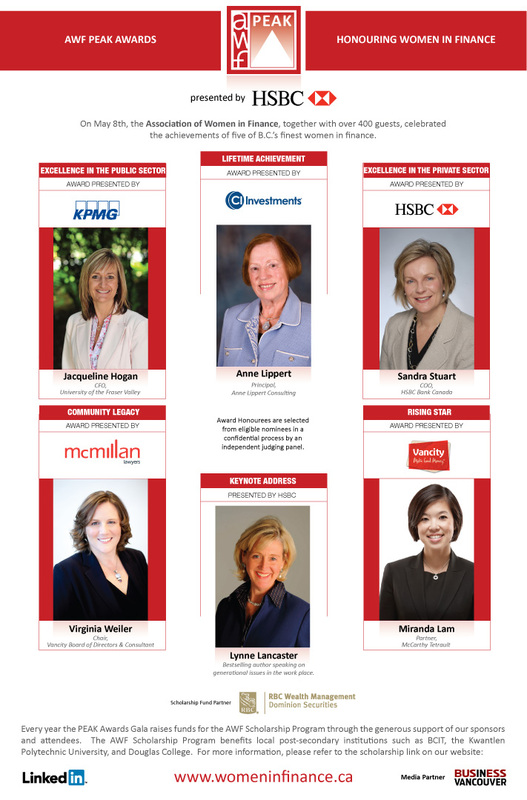 Over 300 guests were treated to inspirational stories of special women who have excelled in the finance industry in Vancouver and the Lower Mainland. The AWF appreciates the support of everyone who sponsored and attended the PEAK Awards gala and this includes your very generous AWF scholarship donations. This year we raised just over $10,000 for our scholarship fund! The AWF exists to support women in finance. Providing assistance to students who require financial support in order to reach their goals in the finance industry, speaks to the core of that mission.